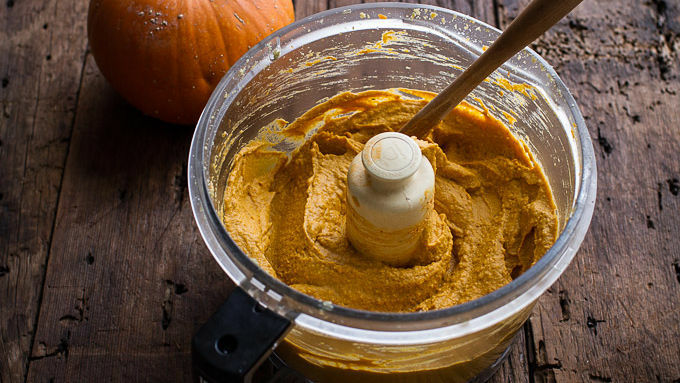 Combine the chickpeas, pumpkin and olive oil in a food processor and puree until smooth. Finely chop the chipotle chilies and add to a bowl. Mix the chilies with the garlic, honey, cinnamon, cayenne, cumin, oregano, chili powder, and salt and pepper. Stir half chipotle mix into the hummus, and add the remaining to the top of the hummus. Drizzle with olive oil and sprinkle with pepitas seeds before serving. Serve with chips, naan or other foods for dipping. This can be made up to 4 days in advance. Just store in an airtight container until ready to serve. Warm naan, apple slices, crackers, carrots, wheat toast, roasted vegetables, pita bread, graham crackers, etc. 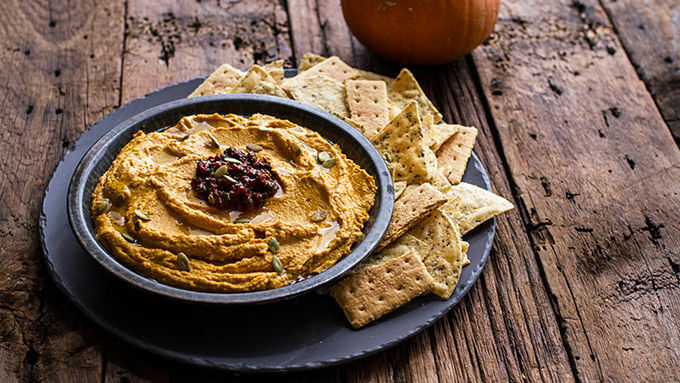 Hummus got all dressed up for fall. It’s just that time of year. The time of year when pumpkin can be stirred into pretty much everything. From pumpkin breads, to soups, to pancakes to cookies – yes, I’ve even made pumpkin Oreos! September through November it’s pumpkin this and pumpkin that. I even saw pumpkin recipes in August this year. Personally, that’s just a bit too early, but come the end of September it’s pumpkins all the way! 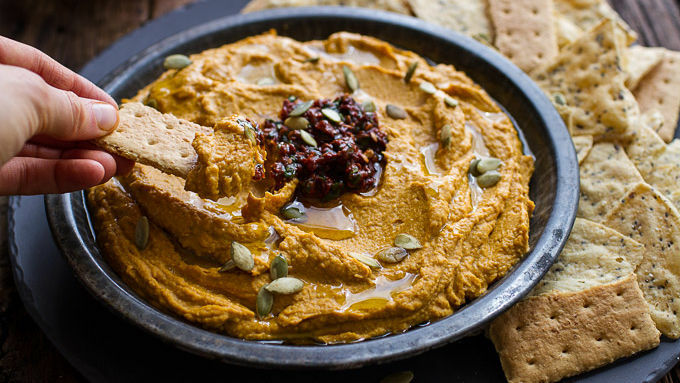 Today I'm using pumpkin in one of my favorite savory ways: Hummus! It’s perfect for holiday entertaining and, oh my gosh, it could not be easier. You literally just add the ingredients to your food processor or blender, pulse and ... done. I love the combo of sweet and spicy, especially when paired with pumpkin. I like to serve this hummus with graham crackers, naan, chips, pretzels, apples – really almost anything! It’s great with so many things. Sometimes I like to add in some cheddar cheese too. This can be made up to 4 days in advance. Just store in an airtight container until ready to serve. Grab some chips or whatever you want to eat with it (try warm naan, apple slices, crackers, carrots, wheat toast, roasted vegetables, pita bread, graham crackers, etc.). And dip away. So yummy!